Tigard-area lawmakers Sen. Ginny Burdick and Rep. Margaret Doherty sponsor event set for March 12. Oregon Gov. 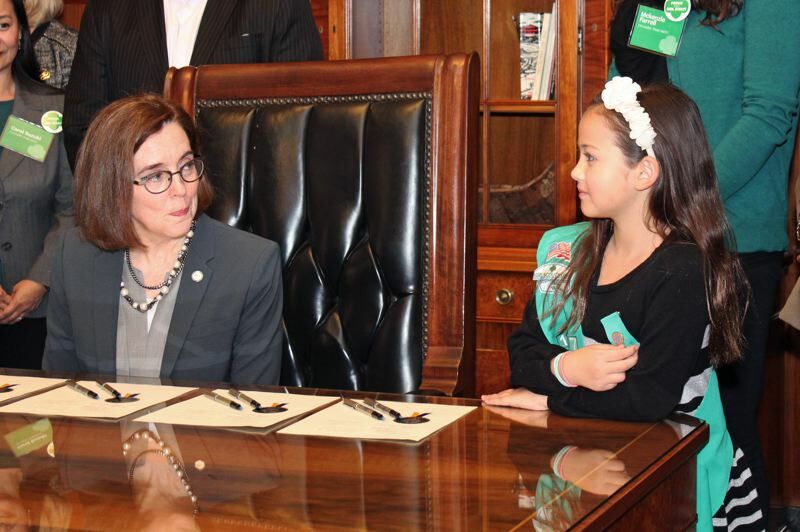 Kate Brown will proclaim Monday, March 12, as Girl Scout Leadership Day in Oregon. The date marks the 106th anniversary of Girl Scouts of the USA, which began March 12, 1912, when Juliette Gordon Low assembled 18 girls from Savannah, Ga., for the first Girl Scout meeting. Girl Scouts of Oregon and Southwest Washington also will honor Brown as a lifetime member of Girl Scouts. The event is sponsored by Senate Majority Leader Ginny Burdick, whose district includes Tigard, and State Rep. Margaret Doherty, also of Tigard. "Girl Scouts of the USA has a proud history of raising up generation after generation of female leaders," Burdick said. "I am proud to welcome this group of future leaders to the Oregon Capitol. Girl Scouts play valuable roles in their communities through community service and learning skills that will help them succeed in life." Doherty echoed those sentiments. "With every Girl Scout I meet, I am reminded of how bright of a future we have with these courageous, confident, young women of character," she said. "I am certain that among these young women are future legislators, business executives and community leaders. Undoubtedly, through their involvement in the Girl Scouts, these young Oregonians are already leading the way and making a difference in their local communities." Also on hand will be Oregon State Treasurer Tobias Read of Beaverton and former Gov. Barbara Roberts. "Girl Scouts teaches girls that their voices count — that they bring a valuable perspective and that the world needs their leadership," said Karen Hill, chief executive officer for Girl Scouts of Oregon and Southwest Washington. "Girls benefit so much from seeing women like Gov. Kate Brown in the highest leadership role in Oregon — it helps them envision themselves there." Girl Scouts of Oregon and Southwest Washington also will celebrate the G.I.R.L. Agenda: a nonpartisan initiative to inspire, prepare and mobilize girls to lead positive change through civic action. "Just last session, a troop of local Girl Scouts helped pass legislation that will save the lives of animals and children who are locked in cars on hot days," Burdick said. "That is just one example. If a group of elementary school students can accomplish this as Girl Scouts, it bodes well for what they will be able to achieve as adults."